The March meeting will be held Saturday, March 14th at 9:00 am at the home of Karen Valenzuela. Karen lives at 1901 E. Erie St. in Chandler (480-899-0028 ). Please bring your own lawn chairs and bags/buckets for any plants/fish that may be available. From the Northwest/Northeast:: I 101 to Chandler Blvd., east on Chandler Blvd to north on Lakeview Blvd., right on Erie. From the East/Southeast: West on southern Loop 202 to Arizona Avenue, North on Arizona to Chandler Blvd., East on Chandler Blvd. to North on Lakeview Blvd., right on Erie. The February meeting was held at the home of Tom and Carla Briggs. There was discussion on the Pond Tour. Tour members will sell tickets at their sites. There are four homes signed up. Dave Nelson would like to see 6 or 7. If you would like to be on the tour, call Dave. 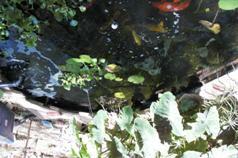 Tom discussed the construction of his 1500 gal pond and displayed his “home-made plastic honeycomb planters.